My love for small, shiny objects began early in life. Pop beads, marbles, even agates I dug out of the asphalt in front of our house filled my treasure chest when I was little. 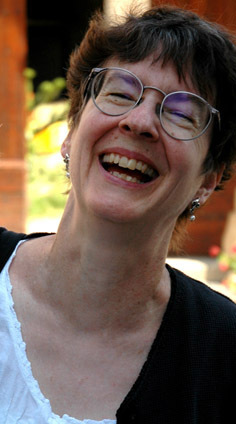 After some years as a wordsmith, I began my jewelry-making journey in 1994 when I took my first class at the Shepherdess beadstore, then owned by Marcie Stone, in San Diego, CA. The wonderful teachers and friends I met there taught me techniques for beading on fabric, bead stringing, off-loom beadweaving, micro-macramé and wire working. Through their eyes, I learned to really look at the world and to listen to my own heart. I discovered metal clay in 1999. I got hooked in my first class. I bought my kiln on the second day of that class. I went on to become certified at the Senior Level with Art Clay Silver and earned a certificate in PMC through the Rio Rewards program. In December 2006 Art Clay World chose to highlight my work in their “Artist of the Month” program. I started teaching metal clay classes at the Shepherdess in 2000. That experience showed me that I love passing on techniques for jewelry making to students—and, to anyone else who shares my addictions! I’ve collaborated with Marcie Stone—founder of the Shepherdess and an exceptional bead and fiber artist—on teaching classes at retreats in Santa Fe, NM and at Gwen Gibson’s studio in Durfort, France. Currently, I teach out of my home studio in Escondido, CA (near San Diego, CA), as well as at several other venues including The Bouncing Bead in La Mesa, CA, the Idyllwild Summer Arts Program for Adults in California, and Patricia Weilbacher’s studio in Arroyo Grande, CA. I’ve also taught at the Arizona Designers & Craftsmen Program in Tucson, AZ. Working with metal clay has led to explorations in a number of related fields, most particularly in traditional metal fabrication. 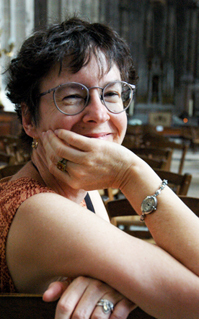 I’ve been studying with Deb Jemmott—metalsmith teacher and jewelry-maker extraordinaire—since 2000. I’m also fascinated by enameling and other ways of coloring metal. The found-object jewelry movement interests me as well. In February 2000, I set up my own business, Designs by Jonna, both to teach and to sell my jewelry through fine craft shows and galleries. 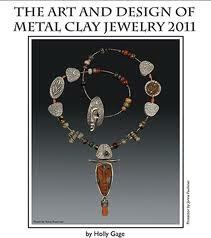 I am a distributor of Art Clay Silver products. In June 2012, I opened my first on-line sales site that can be reached by pushing the “Shop” button up in the menu header. 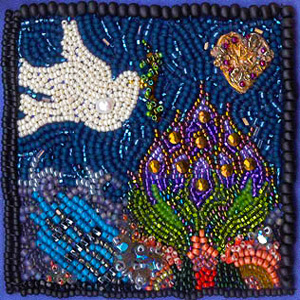 In December 2001, I participated in a grassroots project called the Beadquilt that brought together beadworkers from around the world to honor all those affected by the tragedies of September 11th. I used bead embroidery and metal clay on my square for the quilt. It can be seen in Beaded Embellishment by Amy C. Clarke and Robin Atkins. This project meant a great deal to me, providing as it did an outlet for healing and connection. When I was young, I found my voice in poetry. For many years, words continued to be the medium through which I understood the world around me and found my own place within it. All that changed when I took my first art class at age 42. As I learned to embellish cloth with beads, silk ribbon, buttons and other objects—to create pattern and story with my hands—I found that the tactile arts spoke to me even more deeply than the written, that they offered a more seductive path to creative expression. Working with my hands has taught me important life lessons. I discovered that satisfaction can and must be found in the process of making, not solely in its results. Perfectionism stifled me until I realized that “mistakes” are keys that open doors to new ways of seeing and doing. As my hands freed me, I dared to grow by taking risks. Making art has helped me to embrace life joyfully. For me, the process of creation is also a form of meditation. As I work, my mind, heart and hands are one. All else falls away. I focus fully in the present. Sometimes I even feel as if I have merged with a powerful creative energy outside myself that guides my hands. I think the urge to live on after death must be universal. I have no children to give to the future. Even so, I believe I’ve captured a small hold on immortality through my work. I imagine mothers passing on pieces I have made to their daughters, and so on and on through time. They will not know my name but I will have become part of their family history and so I will survive. When I put needle to thread, file to metal or hands to clay, I forge a connection to all those—past, present and future—who feel the urgent need to express themselves and their vision of the world. I join a community that I hold in high regard. I look forward to continuing to explore ways in which beadwork, metalsmithing, metal clay and other media can be combined to create objects of beauty and contemplation. – Author, “Persephone’s Vessel,” a how-to article in Fired Crafts Magazine, December 2008, reprinted in Metal Clay Today magazine, 2012. And, most of all, my husband, Steve Rossman, who makes everything possible. and now I am teary eyed that my name is on your list…thank you. It was a pleasure speaking with you today…. Looking forward to meeting and working together! Me, too, Angela!!! More later!!! Do you have any PMC classes in the near future? I want to learn how to make impression of things I find in nature and torchfire them. I am an artist who has been inspired to create something new from bits of shard from my many years of hand painting ceramic tiles. I have been watching quite a few videos on PMC and bezel making, however I have yet to see one takes a silver smithed bezel and soldering to PMC. Is it possible? It seems it should be as PMC is silver after firing. Do you have experience doing this technique? If so are you willing to share your knowledge? Can you please let me know about classes. I am a beginner in this medium. I live in Central Ca but my daughter lives in Carlsbad. I am willing to travel and eager to learn.